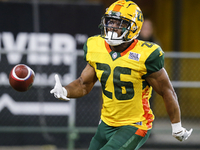 Wolford threw four touchdowns passes — two to Rashad Ross — as the Hotshots (1-0) turned a three-point halftime lead into a comfortable season-opening victory on the strength of a 16-0 third-quarter surge. Tied at 8 early in the second quarter, Folk’s field goal led to a 19-8 Arizona lead before Leslie’s touchdown cut it to 19-16 at the half. Wolford found his stride in the third quarter with two touchdown throws followed by two-pointers to build a healthy 35-16 advantage. NFL Hall of Famer Mike Singletary’s return to the sidelines was a frustrating one hardly emblematic of the defensive dominance he once displayed as a middle linebacker for the Chicago Bears.